We love this Peking Chicken Wings recipe. They are sweet and hot. Depending on your taste buds, you can make them mild to hot to fire engine hot. This recipe calls for 4 lbs of chicken wing for my Chin/Lui gathering, 4 pounds is not nearly enough. We normally entertain about 30 people and I have to make at least 12 pounds of wings. The recipe is easy to make. 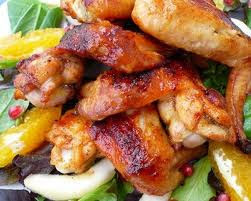 Most of the time is inactive due to marinating the wings in refrigerator. *Note: I have used sweet sherry and it was still good. Reserve some of the sauce for dipping. With the remaining sauce, add chicken wings, coat and marinate for at least 4 hours, preferably overnight. Turn oven on to 375 degrees. Line large, shallow cooking or broiler pan with aluminum foil. Place a large cooking rack on top of pan. Place chicken wings in a single layer on rack. Set aside marinade sauce. Serve hot. As a main dish, it can be served with rice and cooked green leafy vegetable.